← Who Gets Our Kindest Words? 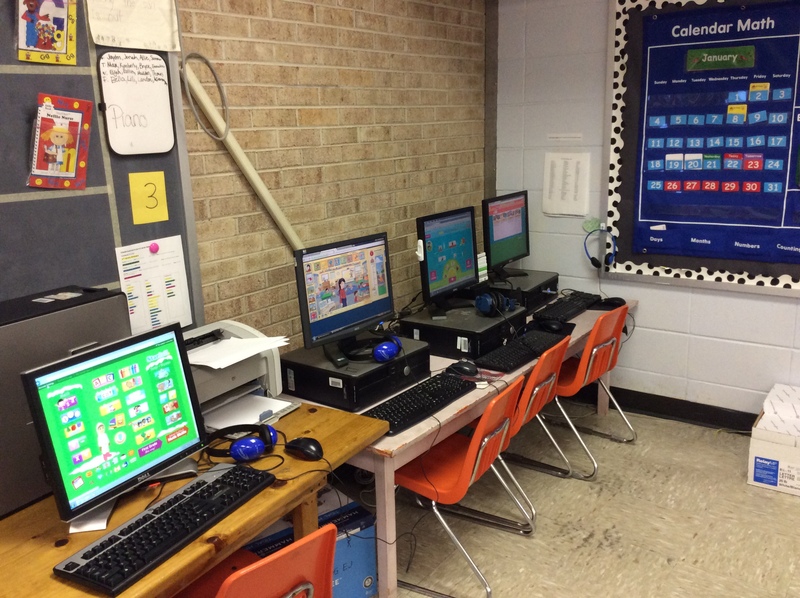 If you go into ten different kindergarten classrooms, you will see ten different routines of literacy work stations. That’s because teachers are people with different personalities, different tolerances, and different preferences. Different managements systems work for different teachers. I have even found that with each new group of students I receive, I have to tweak my system here and there to fit the current group’s needs. So when I was asked to share about my literacy work stations, I was thrilled, of course (I can talk forever about any kindergarten topic) but I did feel the need to point out that although this system works out wonderfully for me and my personality, it may not for others. However, I also want to point out that after ten years of trial and error for literacy station set-ups, I feel like this year’s routine is the easiest to maintain and provides the most authentic learning. The Alabama Reading Initiative was put into place in my school during my first year of teaching. So I’ve been “doing” stations since year one! The first year, I was immediately overwhelmed with the time, materials, and planning that went into my literacy stations. I would work so hard for Monday’s stations…making copies, pulling games out of the cabinet, taping up broken puzzle pieces, etc. Then, when stations were over (and I’d fussed at the kids for about 60% of the time), I’d take up kids’ half finished, messy papers, put games up that were now mysteriously missing components, and throw puzzles away that were just hopeless. And then–I’d do it all again for Tuesday. 3. Activities aren’t authentic- My instruction time during stations can be great with minimal interruptions. For the longest time, minimal interruptions meant “busy work” for my students. I kept asking myself what my literacy goal was for my students and it always came back to these things: reading, writing, and communication. Well, they were communicating, all right. Usually bickering or telling me the radio wasn’t working at the Listening Station. There wasn’t much writing, unless it was on a worksheet, and I almost always closed my Reading Books station due to behavior. In the past years, I began to use my home living station as a literacy station. I loved the oral communication and writing that went on at home living. I saw firsthand how authentic learning can diminish behavior problems and increase morale. I have since moved my home living station to a morning activity, but using this activity helped pave the way for my current station solutions. Also, the book The Daily 5: Fostering Literacy in the Elementary Grades by Joan Moser and Gail Boushey, proved helpful in setting up my very favorite literacy stations ever! My set-up doesn’t match their exactly, but their ideas helped me to create a framework for my room. My main goal was for authentic learning to take place for each student no matter where s/he is located during station time. I do place a lot of accountability on each student for his/her behavior, but I have also realized that certain activities lead to better behavior. My other goal was for each station to be less set-up and work for me! I’ve heard the term “If it takes you longer to make it than it does for them to play it, then forget about it!” I decided this would be my motto when creating my literacy stations. My set-up is actually extremely simple. 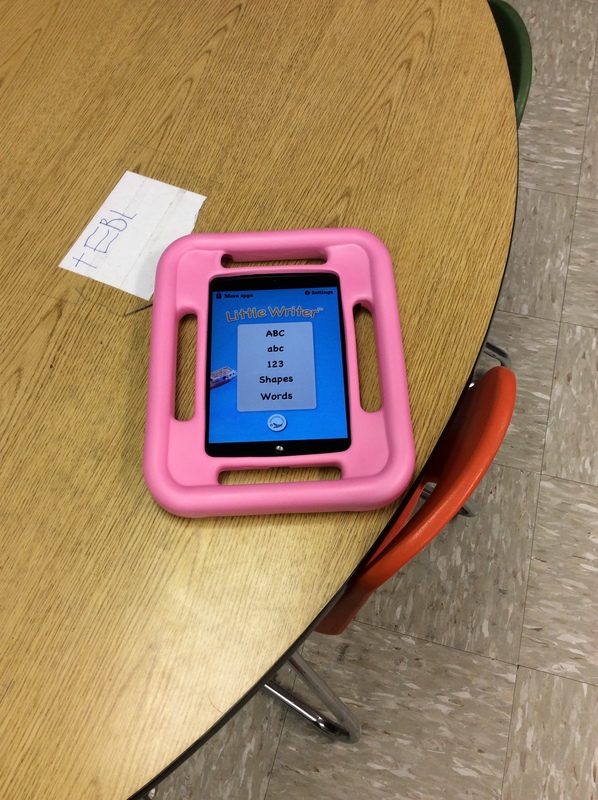 I have four activities during literacy work stations: Reading, Writing, Technology, and Teacher. This student looks at his personal station card and knows that his order of rotation is Reading, Technology, Writing, and Teacher. The pictures show him what to do. In Reading, four students have a book bag that contains books of their choice. At the beginning of the year, we have about three books per book bag. 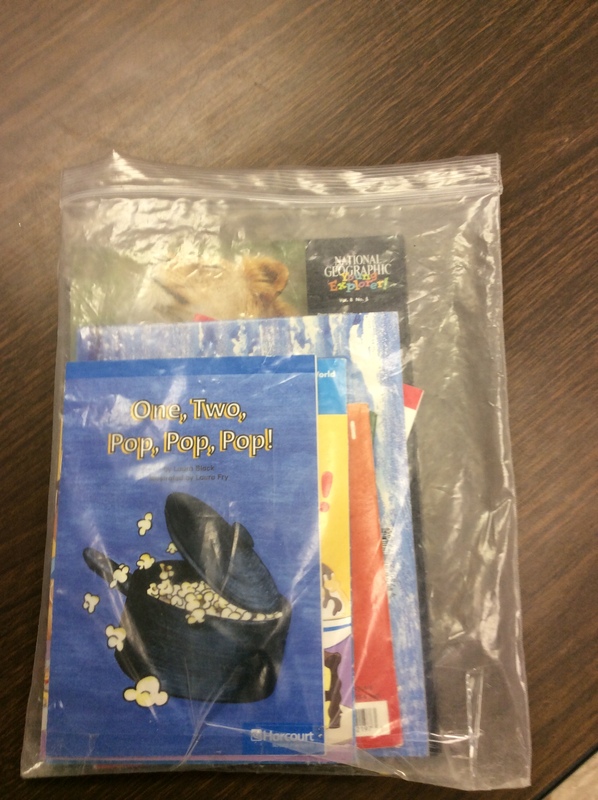 By January, we have worked up to nine books in our book bag. 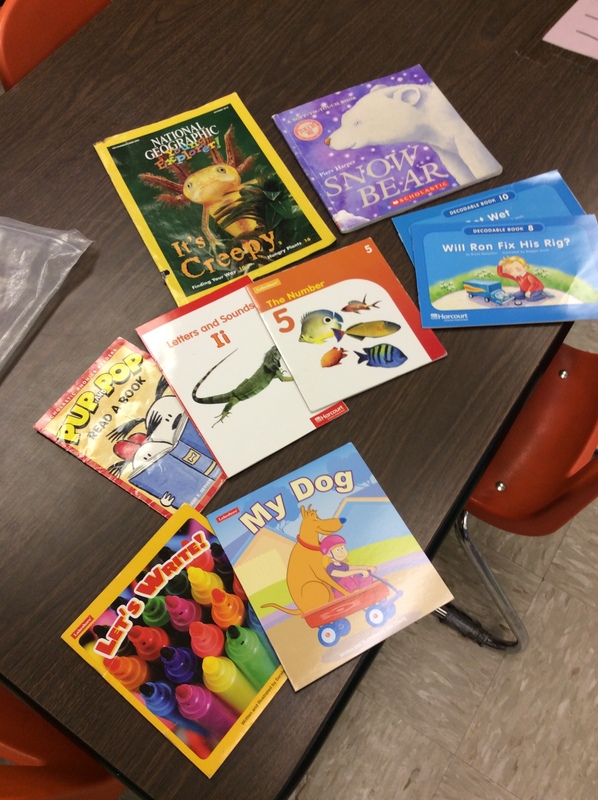 Book types include decodable books, predictable readers, sight word books, magazines, and trade books. At the beginning of the year, we practice how to read to ourselves or to a partner in a quiet voice. We practice how to “read” a story when we don’t know all the words (make up words, talk about the pictures, say what we think the story is saying). We practice how to find a quiet spot in the room that won’t bother another student (students LOVE that they get to choose their own place for this station). We even practice what to do if we think we are bored! Once I feel we are ready to be trusted with reading to ourselves or a partner, Reading becomes a station. I think that this station requires the most effort from students to stay on task, but this station is the most important. We change books out weekly, and because students get to choose their own books, they are very engaged. 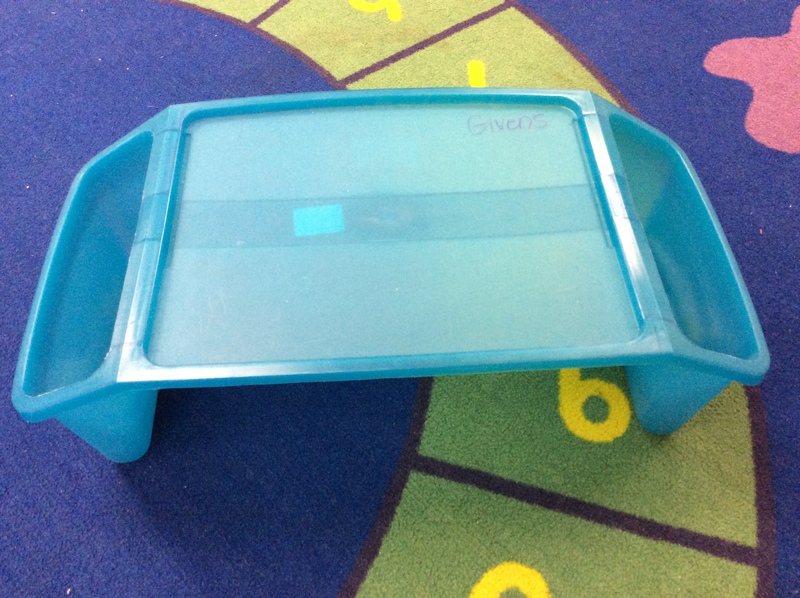 This lap desk can be used anywhere in the room. 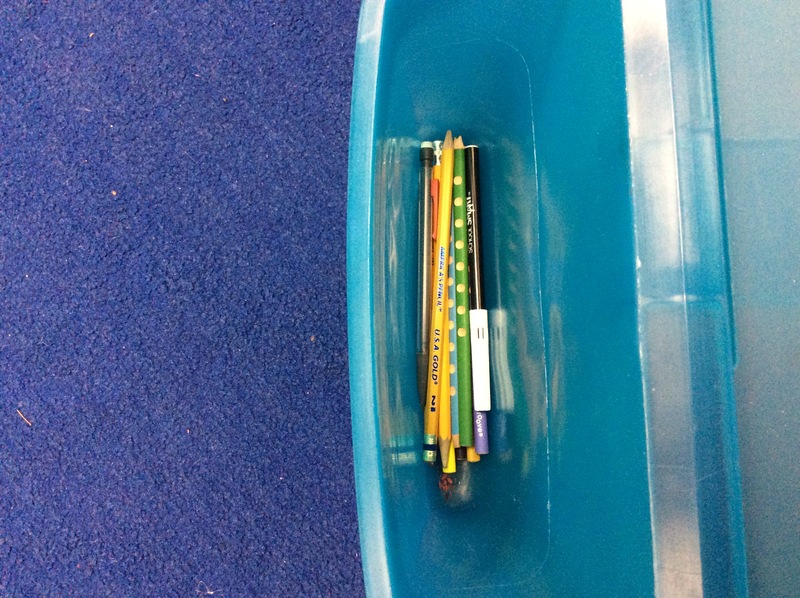 Special writing supplies can be stored in the sides of the lap desk. Mondays- “Write the Room.” We write any words we see in the room. 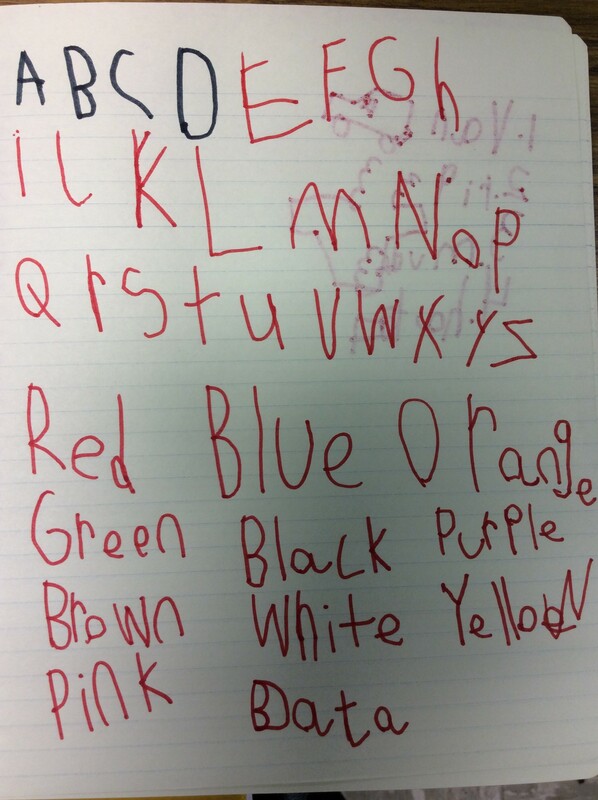 A student may write color words she sees on the wall, or number words that he knows. Someone may write numerals or letters, or the weekly poem. Tuesdays- Write a narrative story. 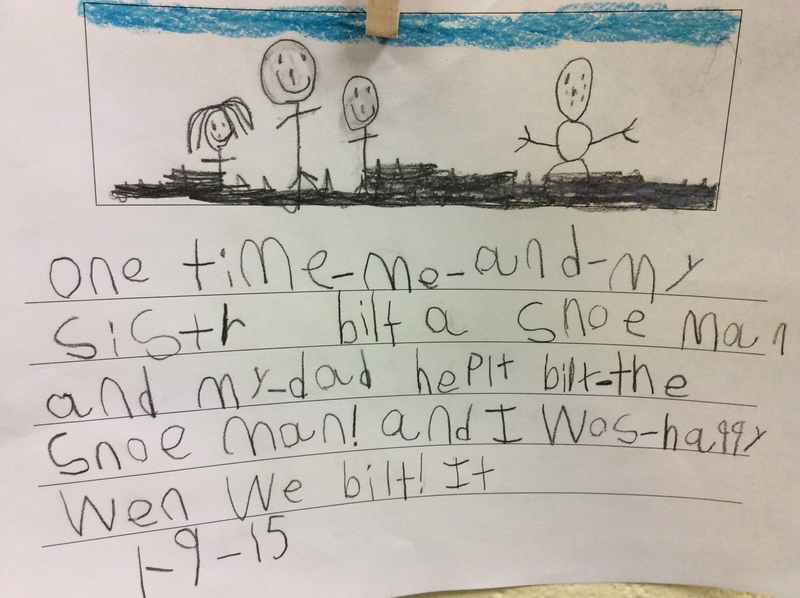 Students write and illustrate either an event that happened in their lives or a fiction story. Thursdays- Write an informational piece. My students LOVE writing facts about animals, holidays, etc. Fridays- Writer’s choice. 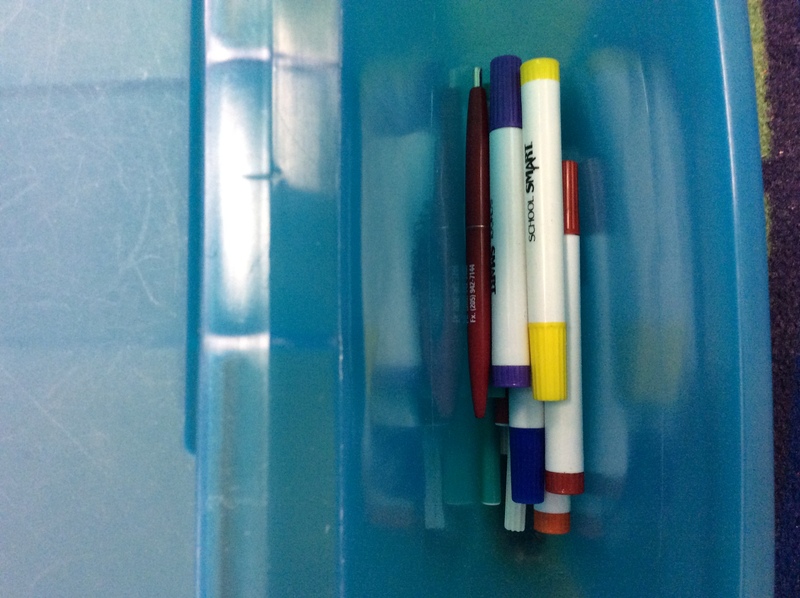 I let them draw what they choose, label what they choose, and write as many or as few words as they wish. Some wonderful pieces come from this day. In Technology, students work at computers, the keyboard, iPads (we were so fortunate to receive a grant for two iPads this year), or even leap pads. Technology doesn’t have to be only computers. Due to the stress level it causes for me personally, I have totally done away with listening to books on tape/CD. Oh. My. Word. The headphones quit on us after about two weeks every single year. The play button goes missing. The tape breaks. The CD skips. I’m over the listening station. We do listen to stories on CD as a whole group, but not in stations. In stations, we listen to books on the computer and it’s much easier for this teacher! Keyboard is a class favorite. 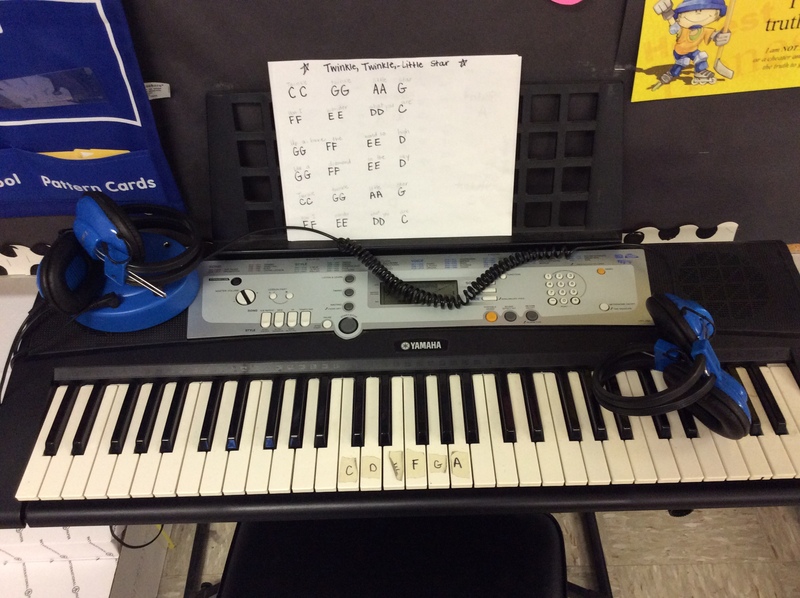 I took my headphones from the old listening station and now use them at the keyboard so partners can play without lots of noise. In Teacher, students meet me at my work table. I work with 2-5 students at a time. I work with students who are struggling on specific skills to support them as they grow. I meet with them every day. I also meet with my students who are on level and above level every day. I will share more about my small group instruction in another post (this one’s getting loooonnnnngggg!). If you walk into my kindergarten room this year during literacy work stations, you will see students who are engaged in reading, writing, and communicating. You won’t hear silence, but you will hear a quiet hum of young voices sounding words out in order to read them or write them. You will hear children talking about their books and magazines with one another and you may hear some kids at the computer who are singing! You will hear me at my table, doing small group intervention. Next year, I may need to do some tweaks when I get new students and personalities. But this station set up has been the easiest and most fulfilling way for me to do literacy stations. 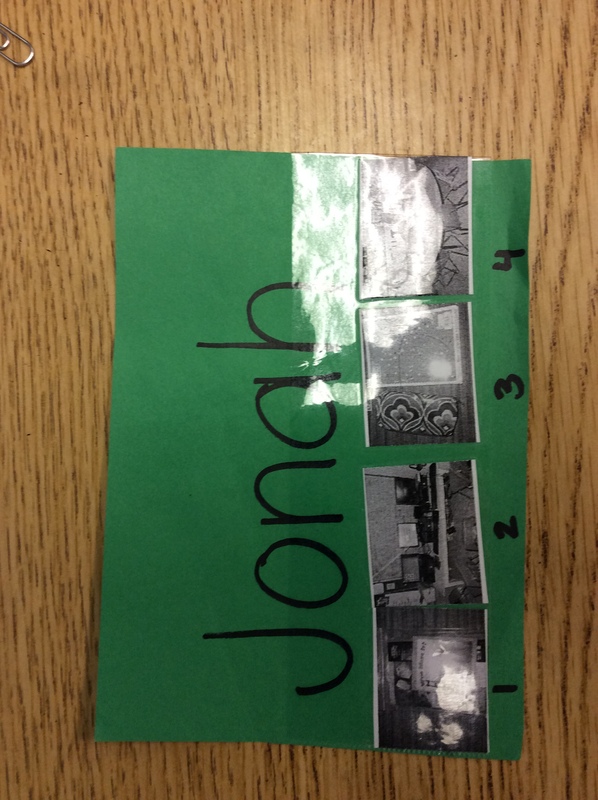 This entry was posted in Teaching and tagged Daily Five, Gail Boushey, Joe Moser, Literacy Stations, Managing Literacy Stations, Paige Givens, Reading in Kindergarten, Small Group Instruction, Station ideas, teaching kindergarten, Technology in Kindergarten, Writing in Kindergarten, writing workshop. Bookmark the permalink. Love these ideas and simple management focused on authentic literacy activities! Thank you so much for your blog I find it very helpful. The thing you said about the listening center is me exactly I gave mine away this year to our preschoolers b/c I can not handle it!! I am curious what your time frame is how long are your students in literacy centers and how long do you work with students during intervention and I’m curious about your small reading groups. Hey! Each station is about 12-15 mins tops. Anything over that, and they just lose attention. As for my small group lessons, I have three types of small groups: 1) those who need extra support and help 2) those who are on level 3) those who are above level. – start with an oral warm up. No pictures, cards, etc. Only listening. I say a word, they tell me the beginning sound. Recently, we’ve moved on to my saying the word and the students “breaking it apart”, or telling me each sound in the word. 2) after the oral warm up, we review our letter for the day/week/etc. We go over picture cards with that letter and practice writing it, stamping it, etc and naming it over and over. If you’ve taught all the letters already, you can review3-6 letters a day. We do about three words and we go back and read them. 4) Read a text. So important. I have a good set that correlates with each letter and another set for sight words. We always correlate some kind of text with our small group target. 2)blending practice: I show cards with CVC words that include our letter of the day/week/etc and we practice sounding out and putting sounds together to read. 3) break apart and spell. Just like #3 above. 4) write a sentence. Spend time putting space between words and using upper/lowercase letters correctly, and punctuation. 5) Read a text that correlates with your skill.